Doodle Earth has proved to be one of Conquer Club’s most popular and also most controversial maps. It only has 18 regions, and therefore is very small when compared with other much larger maps available to be played. Despite popular outcry from a number of higher ranked players, the map was quenched and since then it has proved very popular for short sharp games, especially 8 player doodle earth assassin freestyle speed games (known as "assdoodles") where each player only begins with 2 regions resulting in games finishing in under ten seconds. Doodle Earth works best in a 1vs1 format, due to its small size and quick play, which makes it attractive to people who want a quick game. Other popular settings would be quadruples and sequential 8 player games. While these games can be intense and very good fun, you should be wary of playing them as they can result in elimination before you even start and involve a higher level of luck than the average map! Doodle Earth has been popularized by 8 player assassin speed games, which can be intense and fun as well but should be avoided if you have aspirations to achieve a score of over 1800. 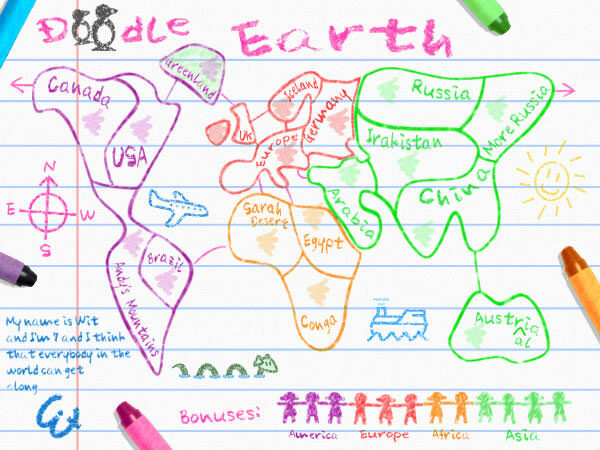 In order to give you the best chance of winning a game of Doodle Earth, the easiest zone bonus to hold and the best one to go for tends to be the Africa bonus, as it only has 2 borders and 3 regions. Europe is also often a good bonus to attempt to hold as it has only 4 regions. However, it isn't advisable to assault neutral regions in order to gain these bonuses. If there are neutral regions blocking these bonuses, then it is better to leave it and concentrate on hitting your opponent. When there are spoils in play, you should aim to reinforce your troops closest to your opponent as this will help prevent him picking up a spoil, giving you a better advantage. In a Doodle Earth team game, the best strategy is to go immediately for an opponent elimination. This is especially true in quads where one can be killed without even taking a turn which is why this map is often avoided by high rankers who prefer more complex maps. Flat rate should be avoided and only played if you want to make the game all about luck and who can get a decent set first. If you get a mixed set with 3 spoils, victory will most likely be grasped if the other player only has 2 spoils, but if the other player has 3 or 4 there is still the potential for a counterattack. When playing with this setting one should always attempt to set your reinforcements up so that is near impossible for your opponent to get a spoil unless he is to assault one of the neutral regions. This can be done by always reinforcing towards the border. Unlike most escalating games, in Doodle Earth the best advice is to go for a spoil on your first turn, as well as every turn after that. This is essential particularly if your opponent has the first turn as otherwise you can end up 2 spoils behind and this will put you in a much weaker position. Best advice would be, like in flat rate to try and prevent your opponent from picking up a spoil at all costs and try to eliminate your opponents before they cash in their own set of spoils. Fast fingers are required for this setting. In the popularized Doodle assassin games, the game can be over within seconds and lots of points are up for grabs. Unfortunately, the deployment often prevents an individual from hitting their target but if you are close to your target it is advisable to strike quick and fast. If you are not close to your target, it is better to deploy and then wait it out until you see an opportunity arise to reach the target and hit them. In terminator and standard settings, the best strategy is to spread your deployment on the first turn, so that you don’t have any 3s left as this is often what opponents will attempt to hit first for a spoil if available. Waiting for the right opportunity and striking fast is essential for victory on this setting. With deployment set to manual the games can be even faster as players can take out their opponents almost immediately. Doodle terminators are also popular as are standard doodle speed games but when playing these settings be warned for high ranks attempting to pick you off. Advice would be to not weaken yourself too quickly when playing this setting but instead to regularly hit regions with only 1 army on them in order to increase your spoil count. When it comes to cashing with escalating, try and cash as late as possible after other players in order to ensure that the spoil set you cash is as high as possible then attempt at targeting a player who is yet to cash like in a standard escalating game. Manual Deployments are not recommended for this map; the first player to go will likely get a sizable advantage regardless of the number of players. Two and three players receive 6 regions each at the start of the game (12 manual deploy troops); four players receive 4 regions (8 manual deploy troops), five through seven players get 3 regions (6 manual deploy troops), and eight players receive 2 regions (4 manual deploy troops). The starting player can use the additional 4 to 12 troops to eat up opponent singles; or with the typical attacker’s advantage, annihilate opponent troop stacks. Either way, if the player leaves neutral regions to block, he has an advantage he is likely to keep throughout the game. Nuclear Spoils are more likely to play like the no spoils setting, although if the opponent has a bonus zone the player cannot reach, nuclear spoils could re-balance the game by annihilating a key opponent region – if the player survives long enough to cash. There is a 5% chance to draw any region on this map, so the odds of being lucky enough to draw one of the few regions that will hurt the opponent are slim. If you enjoy the no spoils setting and want that chance of getting a freaky cash, go for it. Otherwise, stick to the more popular settings. Luxembourg - 19 regions, 6 bonus zones, and starting neutral regions. Madagascar - 24 regions, 6 bonus zones, no special features. Egypt: Lower – 20 regions, 5 bonus zones and autodeploy bonuses. Duck and Cover – 24 regions, 5 bonus zones, bombardments and double dipping. USA West – 24 regions, 7 bonus zones or collections, and double dipping. This ends the Official Map Guide. However, there may be relevant strategy discussion outside the scope of this basic map guide located in the below further discussion. Please keep the discussion general so it applies to many situations. Guidance about your specific games should go in the main Strategy forum.